I was reminded of all that on Sunday when I met friends at downtown LA’s Library Bar. LA’s version isn’t really in the library — the Central Library is a block away — but this gastropub has a wall of books in a cozy area with couches, rugs and a fireplace, akin to one of those personal libraries in a country estate, and drinks have literary names: the Scarlet Letter, the Tequila Mockingbird, the Odyssey, etc. My friends liked the drinks (I stuck to cranberry juice) and we all liked the food: burgers, fries, beet salad, edamame and pork belly sandwich. 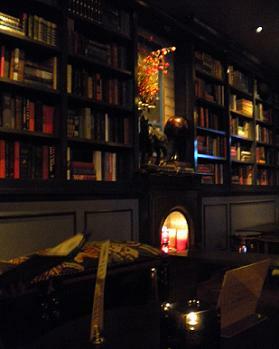 The Library Bar. What will they think of next? Robin and Bob Porter have most of a Metrolink car to themselves Monday night for the 11 p.m. train home from a Dodger game. Wednesday’s column (read it here) is about getting to a Dodger game by public transit. Metrolink is now running 11 p.m. trains on weeknights home from Union Station, and the Dodger Stadium Express shuttle is back that takes fans between the station and the stadium. You can buy tickets from the Dodgers site and read more about the service on the Metrolink site. The train schedule is here. Metrolink also has a train to Angels games, but that’s no good for us, except perhaps for day games, because by the time you get back to Union Station, there’s no train to take you back to the 909. You can read about the Dodger Stadium Express shuttle here. This is an MTA operation. It seems to be popular; the 40-foot bus was standing room only on our two trips Monday. Last year the shuttle carried 120,000 fans. Would you try a Metrolink trip to and from a Dodger game, especially after reading my column and knowing about the time constraints? I wouldn’t be opposed to doing this again, feeling that the pluses outweigh the minuses, but I can see how it would be more trouble than it’s worth for many. Below, fans board the Dodger Stadium Express at Union Station at 7:15 p.m. Monday. Expect the unexpected in this farewell video from the outgoing University of La Verne president, Steve Morgan. I don’t want to spoil it, so let me just say your 4 minutes will be well spent. Our primary area code, like everything else in life, has its own Wikipedia page. I ate at Freddie Mae’s Southern Cooking, in the food hall of Victoria Gardens, on April 22, eating a not-bad fish po’boy sandwich ($7.95). Freddie Mae’s was in the first slot on the west side of the hall, where Nathan’s Hot Dogs had been. I took photos and expected to share them here today. Because I didn’t get a menu and felt I didn’t know quite enough about the place, I decided to try another lunch on Thursday, three weeks later. Perhaps my spidey sense was tingling. When I walked into the food hall, the Freddie Mae’s space was vacated! I had already filed Friday’s column with a mention in my weekly blog report that Freddie Mae’s was my Restaurant of the Week. Oy. So I used my new cell phone to email my boss to ask him to hold my column until I could rewrite the last item. The Freddie Mae’s website says they have a location in Fontana. Well, maybe I can go there sometime. So what did I do for lunch? I went back to Crepes de Paris, already the subject of a Restaurant of the Week in 2008. But this time, I took photos, which I’ve added to that post. On the occasion of Fresh & Easy’s opening in San Dimas a few weeks ago (Feb. 23, to be precise), Gene Harvey sent me this vintage photo, circa New Year’s 1991, of himself and wife Judy atop their Canyon Theater sign on the same site. The Harveys (both doing well, I might add) were known for performing ballroom dance moves together prior to starting each film, hence the pose. 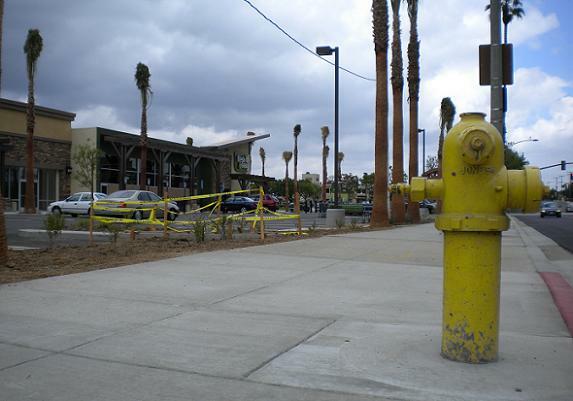 I visited the place myself last weekend and confirmed Harvey’s assertion, shooting a photo on Bonita Avenue looking east toward San Dimas Canyon Road, highlighting the hydrant while working the store into the frame. You can read more about the shopping center in a previous blog post with many entertaining comments. For Monday’s council meeting I parked on East D Street near Upland’s old City Hall/Police Station, an Art Deco gem built in the 1930s, and noticed anew the motto above the door. City Hall moved a block away in 1969. (This building is now owned by the Scheu Companies.) If certain Upland officials had had to see this motto while walking into work every day, the city might be better off. The quote, by the way, is from Virgil. If that’s true, I’m going to need 25 percent larger drawers. Here’s an interview with the guy. The intersection of Harrison Avenue and Indian Hill Boulevard in Claremont is finishing up a revamp. The turn lane west, accessible from southbound Indian Hill, is being closed off and converted into green space. A year or two ago, the turn lane east, accessible from northbound Indian Hill, was closed off for the same purpose. I don’t know if these were good ideas from a traffic flow standpoint, but City Hall must think so. At any rate, the porkchop-shaped green space on the east side is nice, albeit small, and probably welcome to pedestrians. There’s a bench, a water fountain, grass, a sidewalk, mature trees that were part of the previous median and parkway, and a sculpture. Presumably similar amenities will be part of the new west side work. By the way, the horse sculpture on the eastside green space was recently returned to sculptor Barbara Beretich and a new piece put in. It’s titled “Patricia,” perhaps impishly (um, unless it’s a good likeness? ), and it’s by Christina Cassaro. The view in the second photo is on the east side of Indian Hill, looking northwest, with “Patricia” in the foreground and the construction work on the west side in the background. 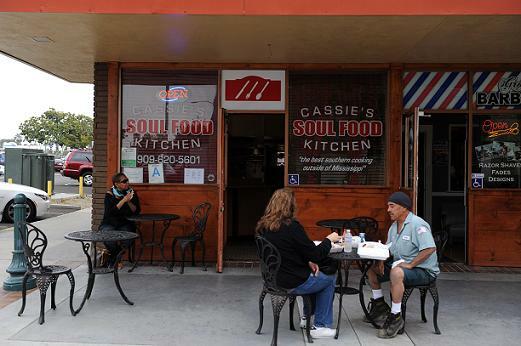 Cassie’s opened in April in downtown Pomona, in the Antique Row space off 2nd Street vacated by Pomona Baking Co. There’s no indoor seating but you can eat at a table out on the plaza, as I did last week for lunch. It’s open daily except Sunday. 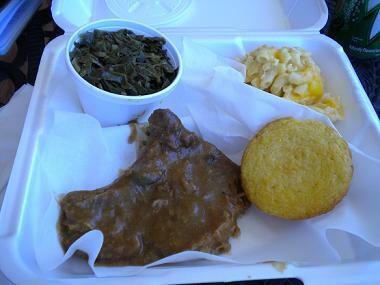 I had the smothered pork chop ($11), which came with a corn muffin and two sides; I chose mac and cheese and collard greens. The food arrived in a foam tray about five minutes later. Soul food isn’t one of my specialties, but the pork chop was tender and the sides were comparable to other versions I’ve had. I would go back. 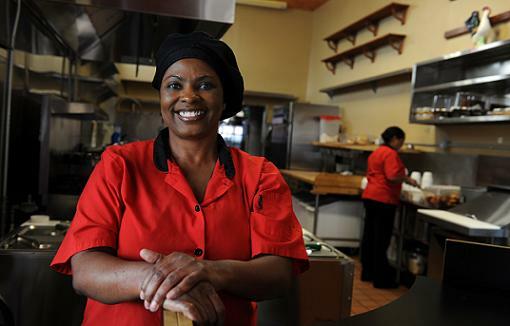 Cassie’s also has baked and barbecued chicken, a few sandwiches and homemade desserts including banana pudding, 7-Up cake and lemon cake. The New Diner got to Cassie’s before I did and filed this ambivalent report. Jeff Malet, who contributed two of the photos here, says owner Cassie Edwards, below, is a native of Mississippi and that her son owns Groom City barbershop next door. Bet I know where he eats lunch.